William Joyce is an American artist, illustrator, and film maker who wrote his first book in the 4th grade. Since then he has written and illustrated over fifty children’s books including George Shrinks, Santa Calls, Dinosaur Bob and his Adventures with the Family Lazardo, Rolie Polie Olie, The Leaf Men and the Brave Good Bugs , A Day with Wilbur Robinson and the Guardians of Childhood series. He did character developement for Pixar Films Toy Story and A Bug’s Life. 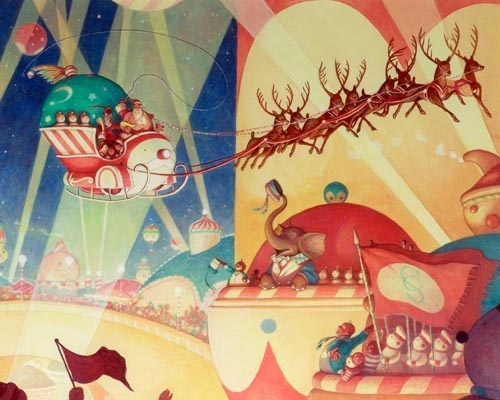 While collaborating with director Chris Wedge to develop his book Santa Calls into a full-length movie, they accidentally came up with the idea for the film Robots. Several movies came after that; Meet the Robinsons*, Rise of the Guardians, and Epic. His animated short film The Fantastic Flying Books of Mr. Morris Lessmore earned him an Oscar just last year. 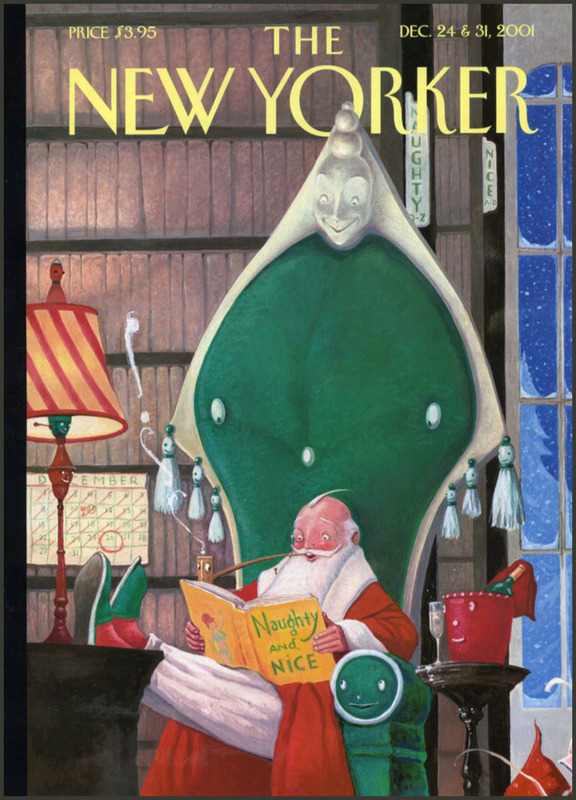 When I was working at Sak’s Fifth Avenue in 1995, William Joyce designed the company’s holiday windows and interiors. and I was introduced to his book Santa Calls. In the book, Art Atchinson Aimesworth — inventor, crime fighter, and all-around whiz kid-journeys to the north pole with his sister, Esther, and pal, Spaulding, by special invitation from Santa himself. Charming book, absolutely charming……buy one here at Amazon. Or buy 2. So you have one to keep for yourself and one to give away. 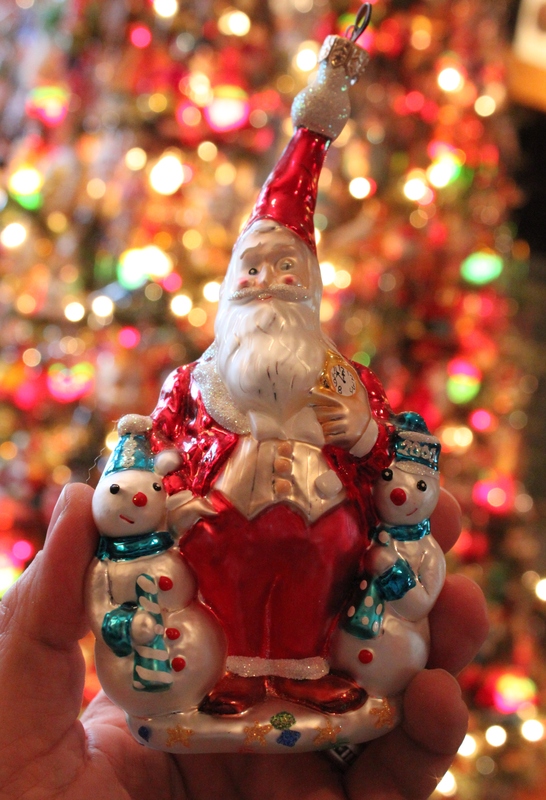 There were even ornaments of Joyce’s vested Santa designed by Christopher Radko. 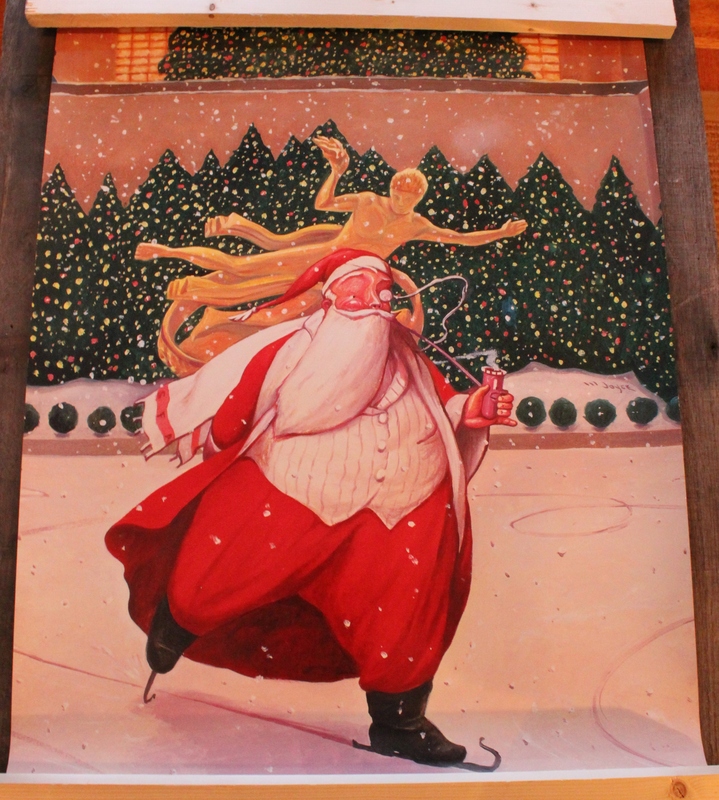 I dug around in the hoard and found that I still had this Saks Fifth Avenue in-store poster of Santa ice-skating in Rockefeller Center. No clue as to what I’ll ever do with it, but I have it none the less. 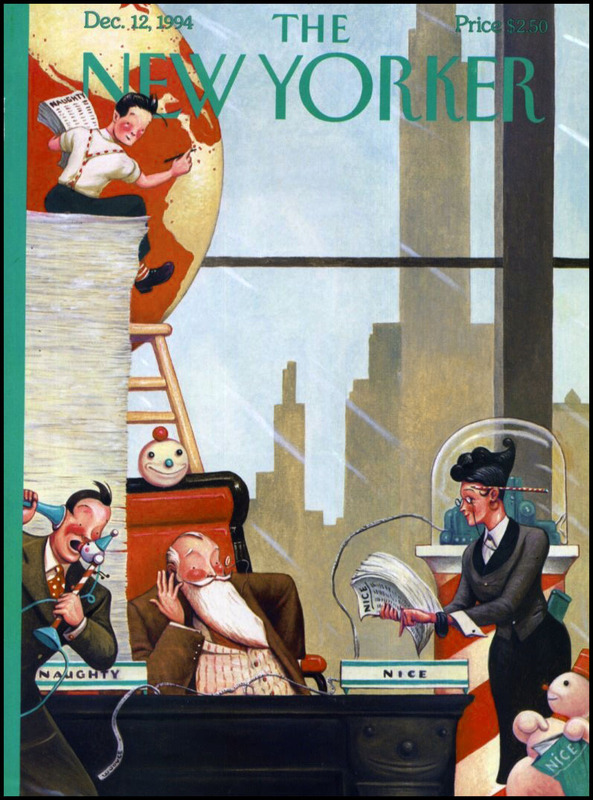 Joyce’s elegant, gentlemanly version of Santa Claus has even graced the cover of the New Yorker a few times. 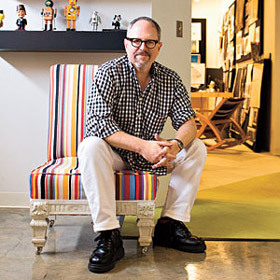 William Joyce takes style influence from the best illustrators—Winsor McCay, Maurice Sendak, Robert Lawson, Maxfield Parrish, Beatrix Potter, and N. C. Wyeth, and mixes them with the sublime—Stuart Little, The Borrowers, and Winnie-the-Pooh—and even the ridiculous—Bugs Bunny, Little Orphan Annie, and Mad Magazine. Very cool post, and I’m glad you were right about “being around for the long haul.” Best Wishes To You Both For A Great Holiday Season! Happy Holidays to you as well, Buddy!!!!! Wonderful post – I love his work. So glad that you do!!! He’s that perfect artist for December…..
What a lovely post. I love children’s picture books and often drool over the beauty of them. It is the artist that makes the book. The blending or art and words is such an simple yet elevated form and I don’t think appreciated by enough people. I did not really know William Joyce before this (but know all the animations and can see his style in them). Thank you so much for sharing this! ps – Santa skating…..I’d frame it and give it a special place each holiday season……with my woefully delayed decorating this would put me in the mood and set the tone. It is so warm and jolly all you really need is some hot chocolate and you are set! Thanks for this! I love all your posts, but especially the edifying ones. 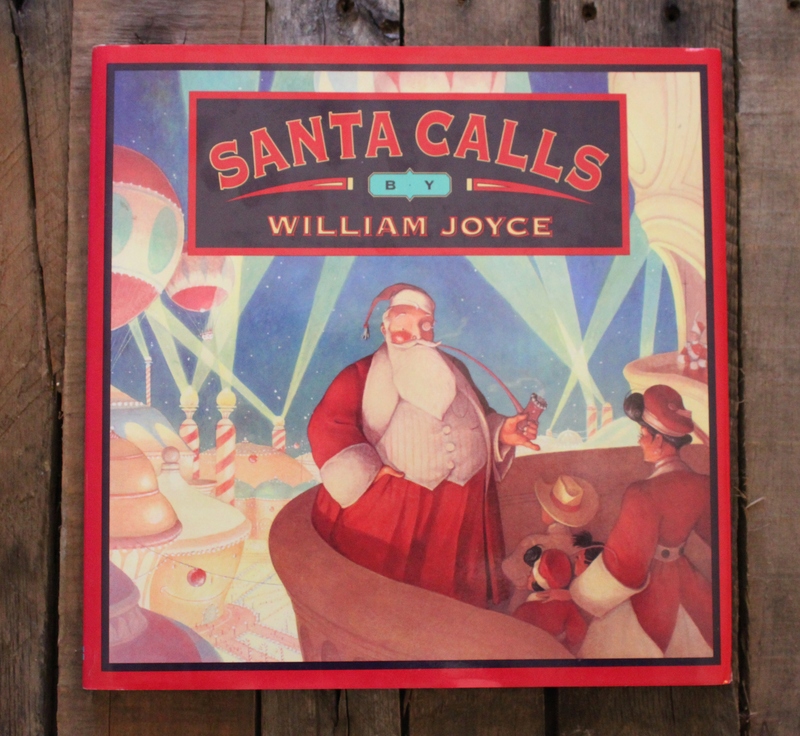 I never knew about William Joyce before. Merry Christmas from frigid Minnesota!